Ready for some brilliant back to school hacks and teaching ideas? Click to see over 30 back to school ideas to help setup your few first weeks of school! We’ve rounded up the very best ideas for you all in one spot. So many great ideas here. If you want to see some amazing and quick crockpot meals that will help save your sanity and time – scroll to the bottom of this post! These are great for teachers, parents, tutors, and homeschool families. Come back often or bookmark the page, we add new resources regularly for more useful and fun back to school teaching activities and printables. Here are some must see resources for some essential back to schoolteacher MUST-HAVES. Click on each image to see each resource in action and to get your copy from each post. Starting the school year off right is important, but sometimes having some quick no prep resources you could pull out for your little learners while you ‘settle into’ your hectic teacher schedule are a MUST! Don’t miss these FREE and AMAZING simple back to school activities for kindergarten. Think letter practice, all about me pendants, school bus bane activity, bulletin board fun, class rules, and number cards! These are some of the best activities you could use during the first two weeks of school. Click on the image below to download your copy of each activity! Fry Sight Word Sentence Posters FREE SET! The Ultimate Game to Teach Sight Words! Use these fun clip cards to incorporate some fine motor into your morning tubs. Use them in morning work, morning tubs or during instructional centers. Need to motivate your kiddos to be on their best behaviour? Use these motivational ‘school bucks’, assign numbers to ‘deeds’ and then hand them to each kid once they do these ‘good deeds’. You could choose to ‘calculate their earnings’ at the end of each week. Check these behaviour incentives HERE or click on the picture below to download your copy! Click on each image to take you to the page and download your freebie! More Brilliant and Fun Activities! Click on the fun ice cream craftivity to help your kids build their social skills and recognise the value of a true friend. Add this color wheel to your morning tubs! Kids will match and clip the colored objects onto the wheel. Download your freebie at this post here or simply click on the image below! These fun owl themed alphabet roll and colour activities will engage your kids with a fun game to identify numbers as well as letters. Download these HERE or simply click on the image below! 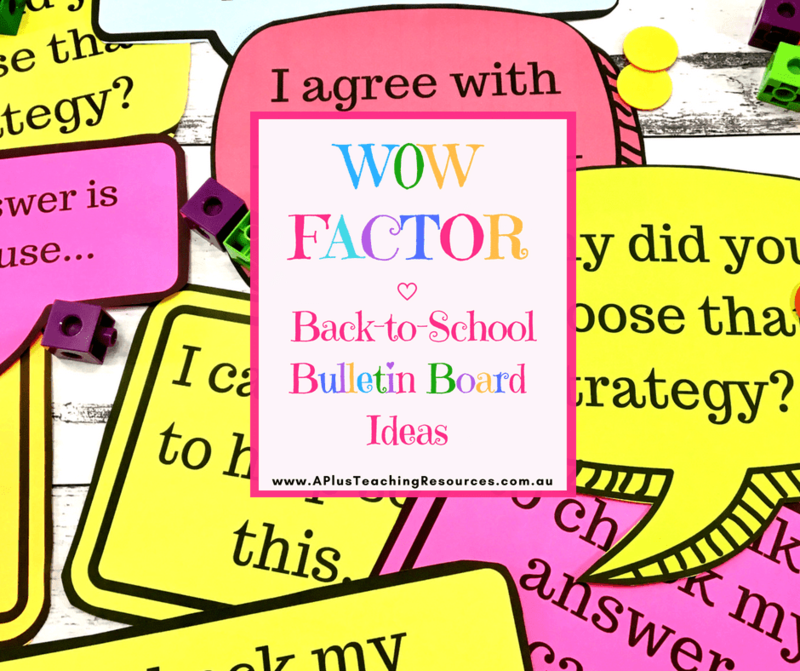 Spruce up your bulletin board this year with these amazing and fun ideas. I love looking at new bulletin boards, they are always so motivational for kids. It starts their year off on the right foot and really encourages them to develop their skills in an inclusive and fun environment. We hope these Back to School Hacks and Teaching Ideas were useful to you! We cannot let you go before you see these colourful and bright bulletin boards. Check out these Kindness Themed Bulletin Board ideas HERE or click on the image below. A+ Teaching Resources included this clever way to help ease math anxiety in children from the get go. Use these math talk prompts on your bulletin board to promote critical thinking and math skills. Download them for FREE from this Math Talk Posters post here or click on the image below! Love Terriyaki Chicken? This is a great alternative to throw in the slow cooker and you’re done! Love soups? This one is a quick one made just in your slow cooker. Only a few ingredients too! Bonus! In the mood for something vegetarian? These enchiladas are mouth watering! And a great mouth watering beef stew! I love this one – especially since the beef will be cooked to utter perfection once this meal is done!